The American Bridge Association is incorporated as a non profit organization for social, educational and philanthropic purposes under the laws of the state of Indiana. Under the statutes of the Internal Revenue Service, it is designated as a 501(c)7 organization. 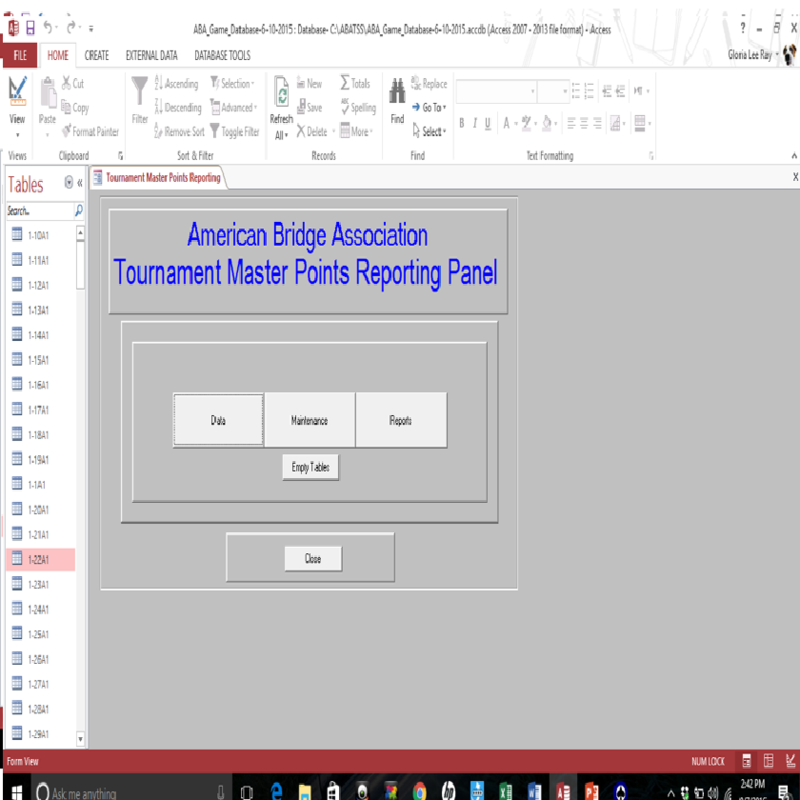 The American Bridge Association Tournament Scoring and Reporting System (ABATSS) is the primary reporting system approved and used by the ABA to electronically receive ABA sanctioned game results directly from the Director in Charge and post the electronic file master points directly in the ABA National Office. Hopefully these instructions are as simple as possible to follow and you will be able to master ABATSS in a short period and enjoy processing all of your C games and higher electronically with the National Office. ABATSS is broken into 6 steps indicated below and will address each for your ease in operation. These steps: Initial Setup, Tournament Setup, Game Setup, Section Setup, ACBLScorer transfer, Calculate and view ABA assigned points and Generate Tournament Report to be sent to Atlanta. Open your computer and select your primary C drive. Open a new folder and name it ABATSS. (All of your TSS generated reports will be saved in this folder.) 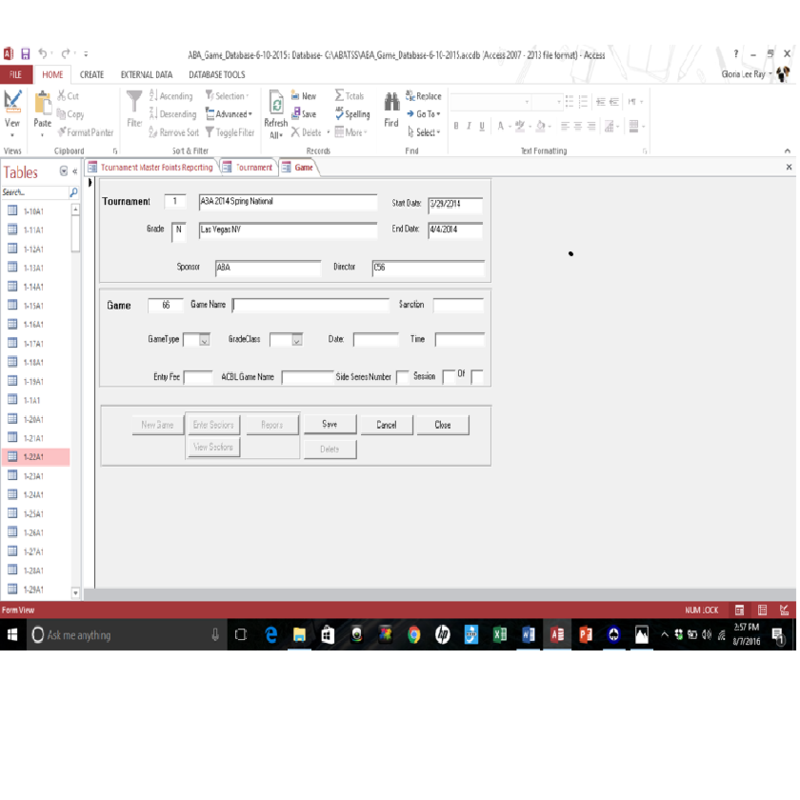 If you have the Microsoft Office Package (2003 or later) you will need to activate Microsoft Access. 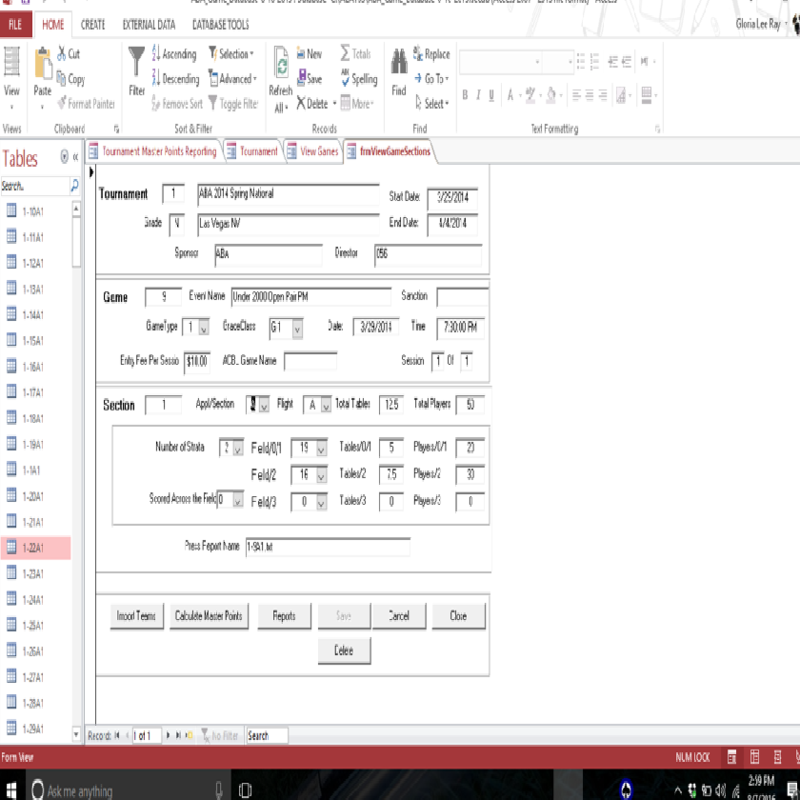 If you don’t have the Microsoft Package you may download Microsoft Access Runtime. This will be the hardest part to get right. INITIAL SETUP is now complete. It is not advisable to place an ABATSS icon on the desktop icon. Access program through your C drive and ABATSS folder. If you are running ABATSS for the first time there may be a yellow tab that says “Enable Contents”. Then to start a new tournament, click on the DATA tab and follow by inputting the correct information. The Reference number is automatically the next number in sequence for tournaments processed. You must remember it as other inputs and the tournament report will be based on this number. Name the tournament ie: Chicago Sectional, Austin Grade A; EE Winn Benefit etc. SPONSOR: Use the drawdown to find your sponsor’s name. When it is selected, the name, State and Section will be filled in automatically. Save your information and the next steps will become available to you. This ends your Tournament inputs and you are ready to input your game. Press the Enter Game tab and be prepared to input game information. Use the calendar tab to select the current date for this event. Enter the time of the event. This entry is critical and must follow this format, HH:MMPM OR AM or H:MMPM OR AM. When you save this game information, you activate the section tab and can enter the section information. Both the Tournament and Game information can be entered pre-tournament or at home before the tournament starts. Total Teams and Players should be left blank as they will total as you enter the tables in each strata. When you enter all strats, save this information and you will be given a PRESS REPORT NAME. This name is particularly important, because this is the name that will be given to the ABCL text file generated for the game. When you receive the Press Report Name you also activate 3 lower tabs. Highlight the Report Name and copy it (Ctrl C) or write it down. Close this screen and the View Games screen. In the File Name block make sure it says Save in: ABATSS, then in the highlighted file name place the curser and paste (Ctrl V) the Press Report Name that was given in the Section tab of ABATSS. Return to the ABATSS tournament screen and select VIEW GAMES then on the next screen select VIEW SECTION. You will note three additional tabs that are activated. Select the tab to IMPORT TEAMS, you will receive a message indicating that the teams have successfully been imported. You are now at the last step of the process, generating the tournament report file that is sent to ABA Headquarters. Close all forms and return to the ABATSS Main Menu. From this Main Menu select the MAINTENANCE TAB and follow with the tab to EXPORT GAME MASTER POINTS. The next screen will request the Tournament Reference Number, enter the number for the tournament you wish to export. ABATSS will now generate a file GMP Export to include results for all of the games you have included in this tournament. You will find this file in your ABATSS folder and it is suggested that you rename this file to reflect a name associated with your tournament ie; (Houston Grade A). This will simplify processing at the National Office. Create an e-mail with this file attached, send to GERT5@BELLSOUTH.NET. Send sanction and fees separately.